In desperation we put a digital clock in my son’s room and explained to him that he was supposed to get up at a certain time. So if he’s awake before 7:00 am, he can go to the bathroom but then he’s supposed to go back to bed and stay there quietly until the clock says 7:00. He shares a room with his 2-year-old brother, who prefers to sleep a little later than his older sibling. Sometimes the 2-year-old gets a little grumpy when his big brother wakes him up, but he gets his revenge…the younger one talks himself to sleep at night and big brother tells him to be quiet when he’s trying to fall asleep. It’s sometimes hard to get motivated to make breakfast for my little alarm clocks who like to wake everyone else up but aren’t yet self-sufficient enough to fix their own meals, and most weekday mornings I’ll heat up some oatmeal or some leftover waffles or pancakes from Sunday breakfast. However, all the kids are sick and home from school this week and I needed to do something a little fun yesterday to keep me sane. So I whipped these up for breakfast and enjoyed them with a good cup of hot tea…a nice, civilized way to start a busy day with my early birds. Move oven rack to the lower-middle part of the oven. Preheat oven to 400° F.
In the food processor bowl, mix the flour, sugar, baking powder, baking soda, and salt. Add the pieces of butter and pulse about 10 to 12 times. The mixture should resemble coarse cornmeal. In a small bowl, whisk together the sour cream, egg, and almond extract until smooth. Pour the flour mixture into the large mixing bowl and add the dried cherries. Stir in the sour cream mixture until large dough clumps form. Press it all together with your hands. Flour your hands. Place the dough on a lightly floured surface and pat into an 8-inch circle about 3/4-inch thick. Brush cream on the top. Cut into 8 triangles and place them on the prepared baking sheet about 1 inch apart. Sprinkle sugar on top of each. Bake until golden, about 18 to 20 minutes. Cool for 5 minutes and serve warm or at room temperature. You can also make these with 1 cup white whole wheat flour and 1 cup unbleached all-purpose flour. When using whole wheat flour, I recommend adding 2 or 3 tablespoons of milk or cream to the mixture to keep them from turning out dry and crumbly. Oh to be so joyful at 5:30 in the morning! Your entire blog makes my mouth water. Those scones are so perfect I can’t wait to try out the recipe. Thanks so much for posting! 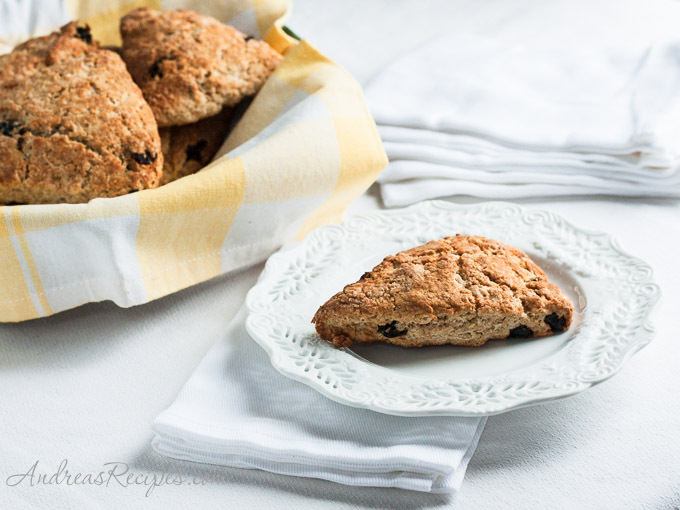 I can’t wait to try these – I love scones – can they be done without a food processor? I don’t have one? Stephanie: Yes these can be done without a food processor, I just think it’s faster. 🙂 If you have a dough blender, that will work great. You can also use a mixer, although it doesn’t get the crumbs quite as fine, or you can use your fingers.